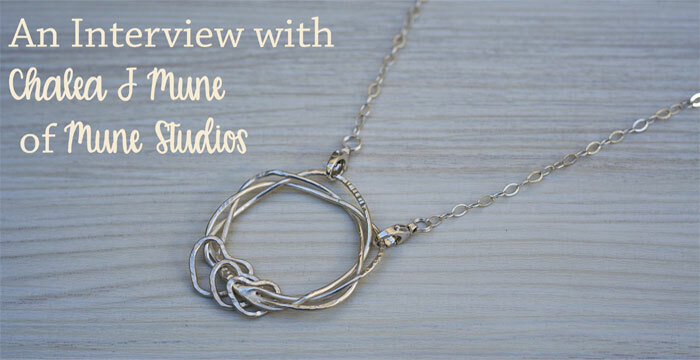 Today we are so excited to have an interview with Chalea from Mune Studios. 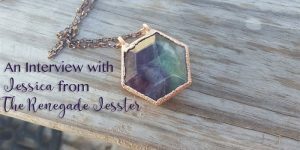 She is a self-taught jewelry artist who is constantly experimenting with new ideas to make jewelry that is beautiful yet durable, perfect for moms on the go. We asked Chalea to share a little bit about her life and her creative process with us. 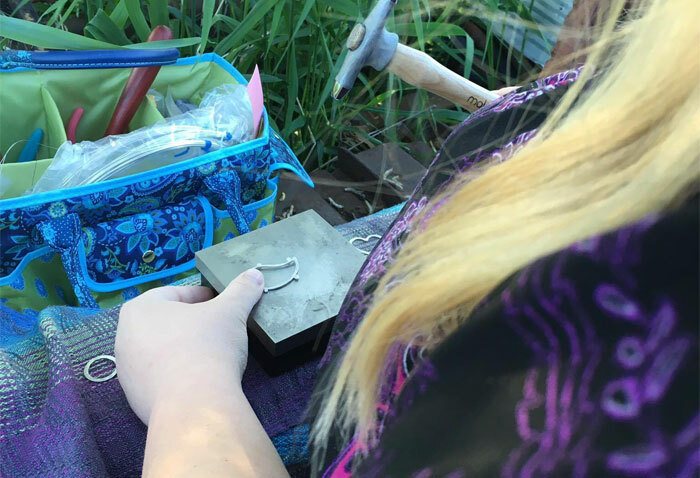 My name is Chalea, I’m a self-taught metal maven and my other name is “mama.” I’ve got two little ones, a significant other, two dogs, two cats, and currently we all live in a house that is over 100 years old. 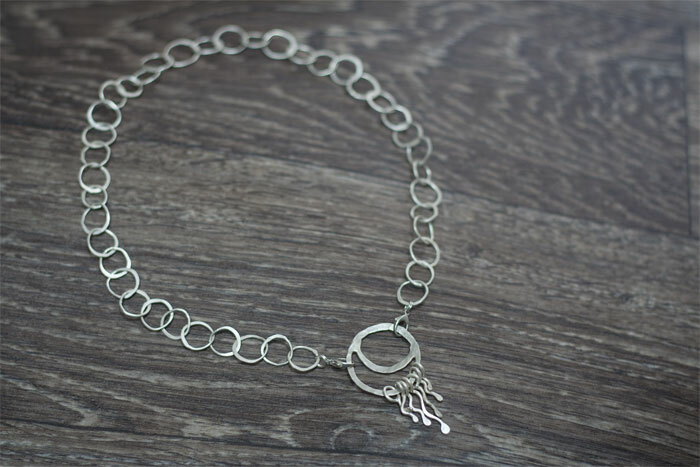 Since I started making jewelry I always tried to make it tough enough for mothers, and since getting into metal-smithing with Argentium silver I’ve come out with a line called ‘Mama Metal’ which is a great fit for people with little ones to wear too. It became my mission to make creations that really speak to those who have sensitive skin. I was not able to wear a lot of jewelry growing up, because of the nickel content, and had wished that there were more out there. That wish spurred my passion to offer people better options. 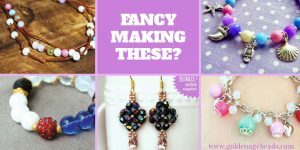 I make each piece by hand with attention to detail; with beads and components that are carefully selected from yesterday’s trinkets, mom-n-pop shops, and small manufacturers who share my commitment on using safe materials. Each piece is heirloom quality and will help make special memories for years to come. Creating jewelry took on such a meaningful aspect in my life where I am free to follow the heart-centered path I feel I have been called to. Jewelry can be such a functional piece of art that can light up someone’s day. The mama metal pieces I make can help mothers and babies bond while telling their unique story. 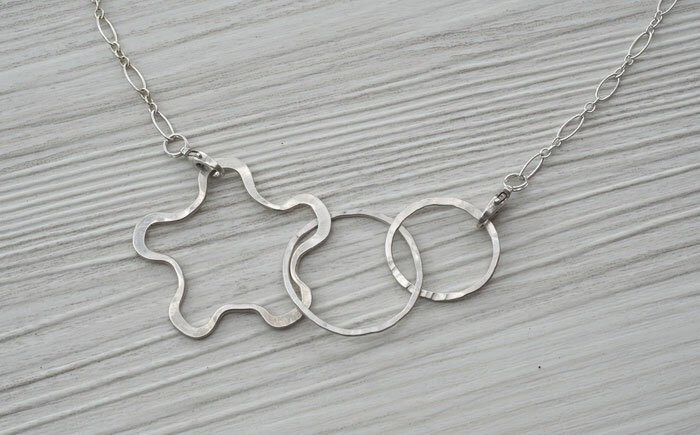 I started making jewelry over 9 years ago… I can’t believe I just typed that! A bit over a year ago I got involved with torching and hammering my own charm designs. 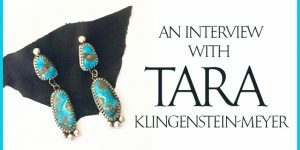 It all started for me when I tried to make my first pair of earrings to match a necklace that had been gifted to me. The owner of the bead store had handed me a pair of pliers and said the first pair was on the house because she knew I’d be back, and right she was! The first pair of earrings I had made were three beads on a t-post. The end had even been pre-made and the only thing I had to do was to attach it to the ear wire. I was hooked from my first pair! It had proved to be very therapeutic after very stressful days working for a huge corporation. It became my mission to make creations that really speak to those who have sensitive skin. 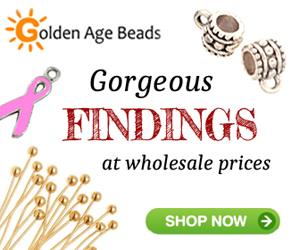 I was not able to wear a lot of jewelry growing up, because of the nickel content, and had wished that there were more hypoallergenic designs out there. That wish spurred my passion to offer people options. My charms are from eco-friendly recycled Argentium silver that’s milled right here in the USA. It’s a minimum of 93.5% silver with less copper than sterling silver which makes it fantastic for use with people who have sensitive skin. It’s non-toxic and I even finish my pieces by hardening them right in my kitchen stove. A lot of the chains are made from sterling silver and many of the chains I use were manufactured in the USA as well. Using USA-made materials is very important to me. It helps to keep our economy going and that is a great thing. 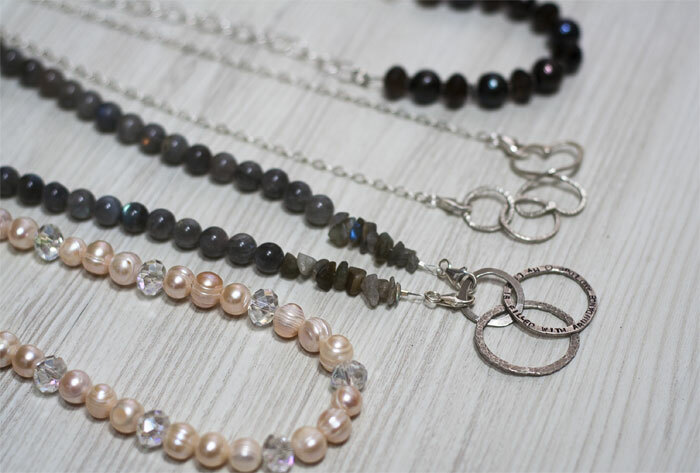 I also love to incorporate gemstones into my pieces and have used many stones from Golden Age Beads. 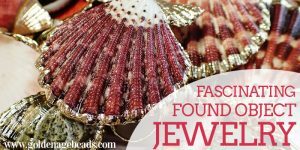 I like to source my beads and components from other entrepreneurs who share my commitment on using safe materials. Each piece is heirloom quality and will help make special memories for years to come. 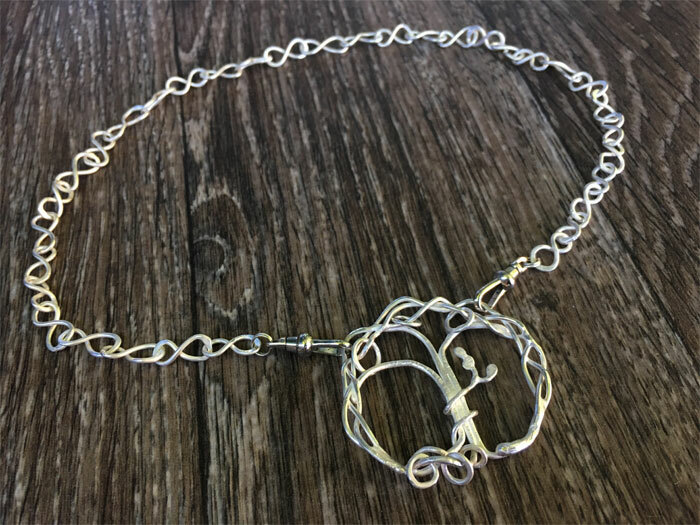 My favorite piece of jewelry that I have crafted was a piece called “Flourish.” It was a combination of a lot of the skills I’ve learned in the past 9 years and the piece really spoke from my heart. It was part of a challenge I did for a Mama Metal competition I participated in. It featured a tree-of-life motif along with root rings and musical fruit; when touched it makes the most beautiful chime. I made it in honor of being a mama and a sapling twists along the mother tree’s trunk before sprouting up towards the sky to symbolize baby-wearing. The roots of the mama and baby tree intertwine symbolizing the nourishment that comes between a mother and baby. The “rattle roots” and “musical fruit” serve as toys for the little one, and the knot work is a tribute to the famous Tree of Life. That can be very tricky since I am a stay-at-home-parent! I am flexible on my working times for sure. If my child goes down for a nap or wants to watch a movie then that is my prime time to work, and again after my toddler goes to bed however you can’t really swing a hammer at that hour. Whenever my children need me, I strive to be right there. 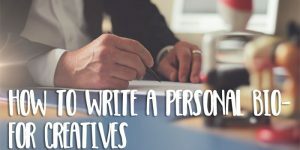 I am fine-tuning my time commitment between being both mama and artist on an ongoing basis, however I know the days I feel like I’ve done a great job being a parent it spills over into feeling good about what I do in my creative work. I try and keep it a constant in my mind on why I want to be successful; and that’s because I want to provide for my family. I made the mistake originally of approaching my business in producing designs that I thought would be good sellers. I ended up with products that weren’t moving because people just were not feeling them. It made me do some soul searching, producing those pieces were not making me happy and were not resonating with my target market. Instead I had this internal voice speaking up that I needed to create from a space of love. I think when I joined the heart-centered movement I saw such a positive shift in my business. People support those businesses they identify with and it’s more important than ever to speak in your true voice. When you put your heart into your work they do see that and in turn it allows you to surround yourself with these amazing people. 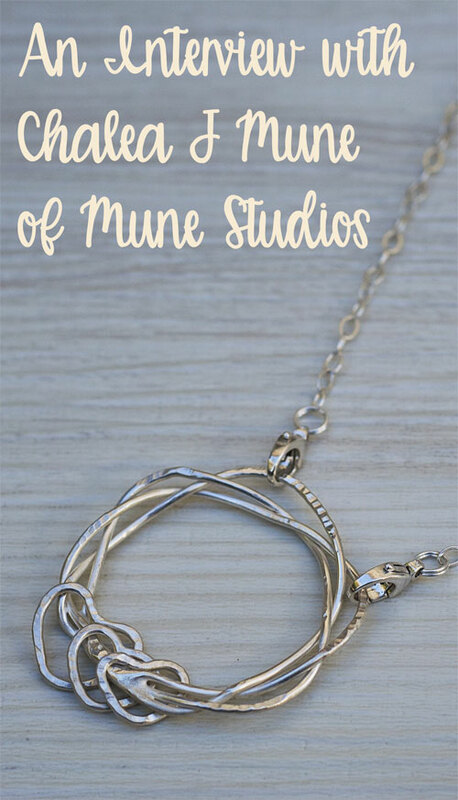 When they wear a Mune Studios product I want them to make a statement to the world that they are supporting the handcrafted movement. My work can be found on my website at http://MuneStudios.com and you can checkout securely with Paypal. Since I seek to keep prices as low as I can my designs are not currently in any retail outlets. If you’re in the Vancouver Washington area and want to host a party or come browse you can shoot me an email at [email protected]. I would love to get together over a warm beverage and get to know more about you! These designs and very beautiful and resonate with me so much! I love the fact that they are safer than other jewelry that I am too sensitive to. 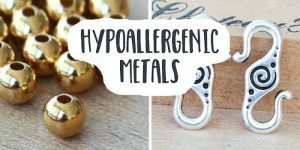 I love that you make jewellery that will work for people with metal sensitive skin and that is sourced from the USA as much as possible.